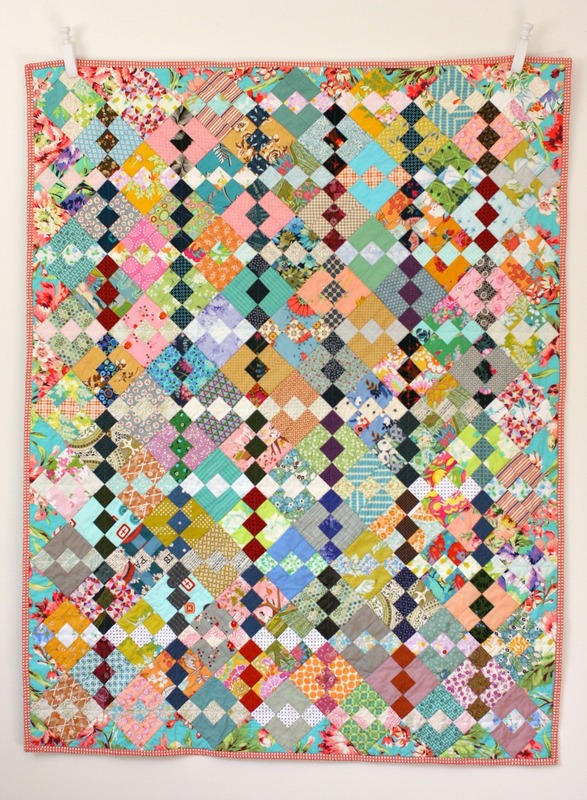 Whilst browsing some of favourite quilt blogs the other day, I came across this wonderful scrappy quilt, made by Jolene of Blue Elephant Stitches. I have long admired her quilts, and her use of colour, but this one just spoke to me. That night when I got home I drafted a block pattern and made a test block. I am going to attempt to follow Jolene's guide lines using only dark and low volumes for the centres and then medium coloured fabrics for the outer pieces. My blocks are 8" square unfinished, I think hers are a lot smaller. This afternoon, I cut, sewed and pressed and have ended up with a nice little collection of blocks. So far it's looking very soft and feminine, and I'm having fun finding pieces of fabric that I don't normally fit my preferred quilting aesthetic these days. I don't know how big this quilt will end up, but I am thinking it may be a nice quilt for a little girl. Here's to a weekend of sewing. It's a busy time of year at present. Miss B and Mr J are sitting exams, summer sports have started, the lawns and weeds are growing faster than I can maintain them. Sometime very soon, I seriously need to think about Christmas shopping and menu planning too. Anyway, here's a little snapshot of what else has been keeping me busy lately. Taking the time in the evening to head down to the little beach, near where I live and appreciate the sunset. Garment sewing plans- the Eva Dress from Tessuti in vintage brick linen, the only downside to PDF patterns is the cutting of lots of pages, fitting them together, then cutting out all the pieces again. Hopefully I can make a start on it this next weekend. A gorgeous inspiring pile of gardening, (it's nice to dream) cooking and sewing books from the library. Loving this simple 16 patch quilt from the book - USE SCRAPS, SEW BLOCKS, MAKE QUILTS. Maybe this is what's needed to get my sewjo back for quilting - a nice simple pattern and lots of colour. though I think I may need to buy a few more solids first. My summer vegetable garden is coming along nicely - lettuce, beetroot and cucumber with African marigolds on one side of the tamarillo tree - the other side of the tree are my tomato plants. Fingers crossed for a prolific haul. Summer colour is starting to clothe my Canna lilies now and bring some much needed colour to my garden, and my star jasmine is just starting to bloom. Last week I celebrated a birthday. I was starting to feel a little peevish with my husband, because he hadn't given me a gift. Imagine my surprise and delight when I arrived home from work on Saturday afternoon, to see my Mum sitting on the sofa, while my husband gave me my gift, which was tickets for us to take part in the Franklin Hospice Garden Ramble the following day. Sunday dawned, warm but drizzly (mum brings wet weather with her, any Australians needing rain should get her to visit them), we donned raincoats, walking shoes and carried umbrellas, and had a lovely day visiting large scale country gardens. I think we managed to visit 11 of the 18 that were open. The following are some of the gardens, vistas, plants and plantings that caught my eye. Meanwhile, I've got a trailer of mulch to spread on my gardens, so that will stop me from thinking I need a house in the country with wonderful views, and perhaps a gardener to help me maintain my dream garden. Yes, it's that time of the year again. Luckily the Festival always begins on a Friday, when I have my rostered day off. This year I met up again with Linda and Raewyn. We had a lovely time chatting, catching up, critiquing the quilts and of course a little retail therapy. I thought that there were less quilts on display than other years,(though I still managed to take lots of photos) and maybe not so many really modern quilts. Possibly because I have been doing a lot of applique those sort of quilts attracted my attention more. A couple of my favourite quilt fabric retailers were absent too, though that was possibly a good thing for my credit card. Here are some quilts that caught my eye, and have hopefully reignited my sewjo for quilting which has been somewhat absent this year.